Halloween on La Paix St.
For some, the idea of driving to Buena Park, Valencia or Downtown LA for some Halloween scares is the right way to celebrate. For others, though, staying local is the way to go and now it is even easier than ever to do so. Local homeowners, like Dr. Death, aka Mr. Chavez, dress their front yards to the nines to give trick-or-treaters the Scary Farm or Horror Nights experience close to home. Chavez decorates his home using lights, backdrops and handmade animatronics to give the most authentic Halloween experience. He creates the animatronic creatures by putting pipes together with duct tape and using kits to make the monsters pose and even move. Once the creatures are put together, he puts them in a mask and costume that matches that year’s theme. In total, Chavez has over 50 costumes that he uses to change the themes of the creatures each year. 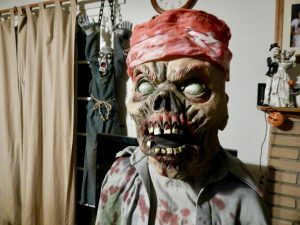 He and his family have been decorating their house on La Paix St. for the past 15 years, cycling through five different themes, ranging from downright scary to more family-friendly spooks. Over the years, he and his family have had a Pirates of the Caribbean theme that involved the family boat to really sell the illusion of being on the open sea. Chavez uses music from the film’s score throughout the night to give a feeling of being in the film. He has movie posters and backdrops as well to provide visuals and uses creatures in themed costumes to allow viewers to interact with the film’s characters. Chavez and his family also enjoy decorating for the theme of Movie Monsters. The monsters he chose are those found in popular horror movies. “Monsters” Chavez has used include Freddy Krueger of A Nightmare on Elm Street, Jason Voorhees from Friday the 13th, Michael Myers of the Halloween series, Ghostface from the Scream series, Chucky, who originates from the Child’s Play trilogy, Tiffany, the bride of Chucky who first appears in the film of the same name, and Jigsaw from the Saw series. Last year, Chavez and his family based their evening on classic Tim Burton films, such as The Nightmare Before Christmas, Alice in Wonderland, Corpse Bride and Beetlejuice. Chavez dressed as Jack Skellington from The Nightmare Before Christmas and Mrs. Chavez was Sally. His cousins were Emily and Victor from Corpse Bride. They dressed the animatronic monsters as the White Rabbit, the Mad Hatter and Alice from Alice in Wonderland, an alien from Mars Attacks!, Beetlejuice, the husband and wife all from Beetlejuice, Edward Scissorhands, and an evil tree from Sleepy Hollow. The family dog was Sparky from Frankenweenie and the family cat was Zero. This year, the Chavez family did a mad scientist theme. They utilized old costumes and new props to create a crazy hospital in their driveway. Chavez was Dr. Death, a mad scientist, while Mrs. Chavez was Dr. G, a coroner. The main look was that of a mad scientist’s laboratory with test tubes, test subjects and a plasma ball. Animatronic characters included a self-rising John Doe corpse, a man in an electric chair, a demonic doctor, a partial zombie in a vat of acid, a hanging man, a blood soaked nurse and a shaking corpse in a body bag. Next year, Chavez and his family plan to decorate based on the film Mad Monster Party. Mad Monster Party is a film from 1967 that features creatures such as the Invisible Man, Count Dracula, Dr. Jekyll and Mr. Hyde, the Hunchback of Notre Dame, Baron Boris von Frankenstein and many more. The Chavez family also plan to have their own monster party in their front yard. The good news is, you are invited too.